Yesterday, I posted about stress (σ = F/A) in geology. Today, I'll talk a bit about strain. Strain, abbreviated by the lower-case Greek letter epsilon (ε), refers to the change in a body from some original configuration to a new configuration. So what's that mean? There are different ways something can strain - imagine a cube of rock acted upon in various ways by some outside forces. Translation - The cube can be shifted, without changing it in any other way, from one place to another. Rotation - The cube can stay in place but be rotated a specified number of degrees about some specified axis or axes. Dilation - The cube can change its size (volume) while still remaining in the same place as a cube. Distortion - The cube can be sheared to change its shape while maintaining a constant volume. The cube can also be subjected to two or more of these changes in various different ways resulting in a very different object from what you started with in the original configuration. You can, of course, treat this all mathematically and it gets complicated pretty quickly. Let's look at some real-life examples. Below is a picture of a lettuce field in El Centro, California. Note how the background has translated to the left compared to the foreground. That shifting was caused by movement along the obvious fault seen on the surface here. Below are rotated minerals within a sheared rock. Below is an example of dilation. The granite which makes up Mount Rushmore formed kilometers below the surface where it was under a lot more confining pressure. As it eroded to the surface, over geologic time spans, it expanded a bit in all directions forming fractures (called unloading joints by geologists). By doing so, this large block of rock increased its volume. Below is the fossil of a trilobite that has been distorted. As the soft sediment it was buried in was compressed and lithified (turned to stone), it stretched out horizontally deforming its original shape. These are all examples of strain in rocks. So, how do you get a rock to strain? You apply stress to it - the more stress applied, the greater the resultant strain. Below are two examples, one with layers of turkey and cheddar cheese and the other with real rock strata. In both cases, these layers were subjected to a horizontal compressive stress. Not surprisingly, the amount of strain in the rock is proportional to the stress it was subjected to during deformation. In the 17th century, English physicist Robert Hooke (1635-1703) figured this out with some springs and weights. The heavier the weight, the more extension of the spring (it breaks down at some point as the spring overstretches or breaks). Basically, however, it's a simple linear relationship where the ratio of stress (σ) to strain (ε) is a material contestant called Young's Modulus (E). Young's Modulus can vary greatly among different rocks types (even within a single rock type). When subjected to geological stresses, a relatively soft layer of marble will behave very differently from a stiff layer of quartzite. Here's what typically happens with a typical rock when placed in a compressive press, for example. As you apply stress, the rock strains (deforms). The more stress, the more strain, in a relatively linear (straight-line) fashion. This strain is elastic strain and is recoverable. When the stress is removed, the strain goes away and the rock is unchanged from when it started. Think of a rubber band. Apply stress and it stretches. Release stress and it goes back to it's original shape. At some point, however, the strain becomes plastic which means it's permanent. Remove the strain and the rock is permanently deformed into a new shape. Thick of it like bending a paper clip. Once you bend it, it's bent. Eventually, of course, there's so much stressing and straining going on, the rock breaks. With plastic deformation, you get ductile strain (flow of the material). 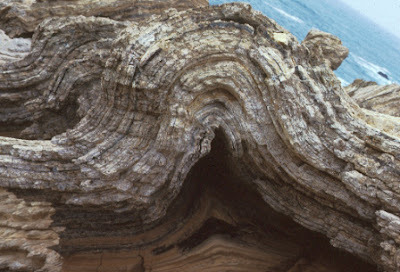 Think of folds in rocks. With rupture you get brittle strain (fracture of the material). Think of faults in rocks. With rocks, ductile vs. brittle deformation depends of the geological material (shale, sandstone, granite, etc. ), the temperature and pressure at which deformation takes place, the presence of absence of water in the rock, and the strain rate (how fast it's straining - take a piece of chewing gum out of your mouth and pull it slowly apart and then pull it apart fast -see the difference?). Keep in mind that this is all way oversimplified, however. Continuum mechanics is a very complex field of study - especially when looking at rocks which are extremely heterogeneous materials, unlike the steel and concrete engineers study. Thanks, fixed (I posted after midnight which is never a good idea).